The life and times of the legendary Lake District fell runner and shepherd Joss Naylor. By Keith Richardson. Colour photography by Val Corbett. This book is dedicated to fell runners. Olympic Gold medal winner and London marathon man Chris Brasher described Joss Naylor as 'The Greatest of Them All,' a title he bestowed on Joss when he ran 72 Lake District mountains inside 24 hours. Joss Naylor's pedigree as a fell runner is undeniable but there is much more to the man. 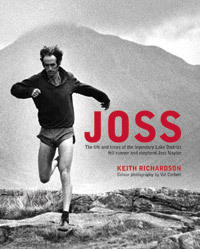 In addition to his considerable exploits in the world of running, this biography brings to the fore other areas of Joss's remarkable story... including his hard childhood and upbringing on a Lakeland hill farm in the wilds of the Wasdale Valley; the crippling back injury he suffered as a boy, an injury that has plagued him all his life and has given him an incredible pain threshold. Here also is Joss the shepherd, the family man who loves his environment with a passion and who holds strong opinions on the Lake District of the 21st Century. The book takes you into Joss's world and it is a fascinating place to be. Chapters are devoted to Joss and his working dogs, to the time that he spends in Spain and to the tradition of dry stonewalling which he has transformed into an art form. As well as containing evocative black and white images from Joss's childhood and his early days as a runner, the book also has spectacular colour photography of Joss and the Lakeland mountains by Val Corbett. This wide-ranging book is a biography and a social history as well as being about Joss the runner, the hill shepherd and the man. It is a superb second publication from Keith Richardson and his River Greta Writer publishing house after the success of 'Ivver Sen' the highly acclaimed winner of the 2009 Lakeland Book of the Year. Keith Richardson's second book published under the River Greta Writer banner was a biography of Joss Naylor the legendary Lake District fell runner and shepherd.